SCHWABE USA Straight Ram Hydraulic Beam Press with Die Vac vacuum cutting system. SCHWABE Straight Ram Hydraulic Beam Press with Dievac System - High volume manufacture of automotive interior trim components is achieved with great precision and excellent material efficiency using Ontario Die International's Dievac system on a SCHWABE progressive feed straight ram hydraulic beam press. 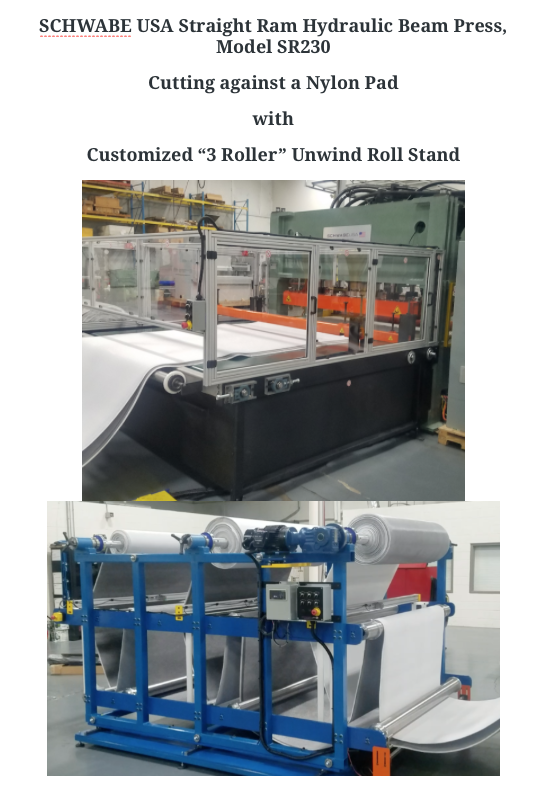 This system of diecutting is used for cutting both rolled and sheeted laminated fabrics and vinyl in multiple layers in widths up to 2.5 m wide. SCHWABE USA Straight Ram Hydraulic Beam Press with Die Vac vacuum cutting system for high volume cutting automotive parts components. Inverted steel rule dies, cutting upwards, are designed and built by Ontario Die International. These precision cutting dies are built to close tolerances for accurately cut parts, with premium steel and dieboard for long life, and our designed to be maintenance free. 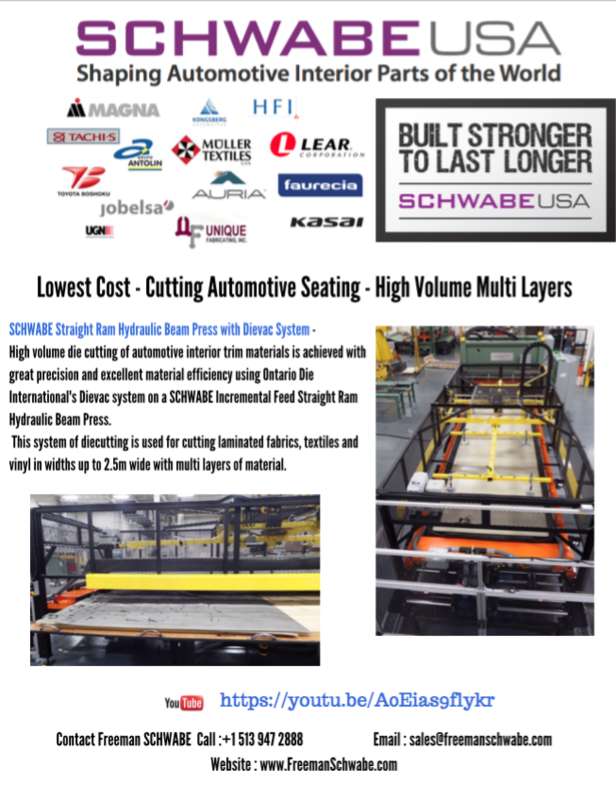 SCHWABE USA Straight Ram Hydraulic Beam Press Model with Die Vac vacuum cutting system. 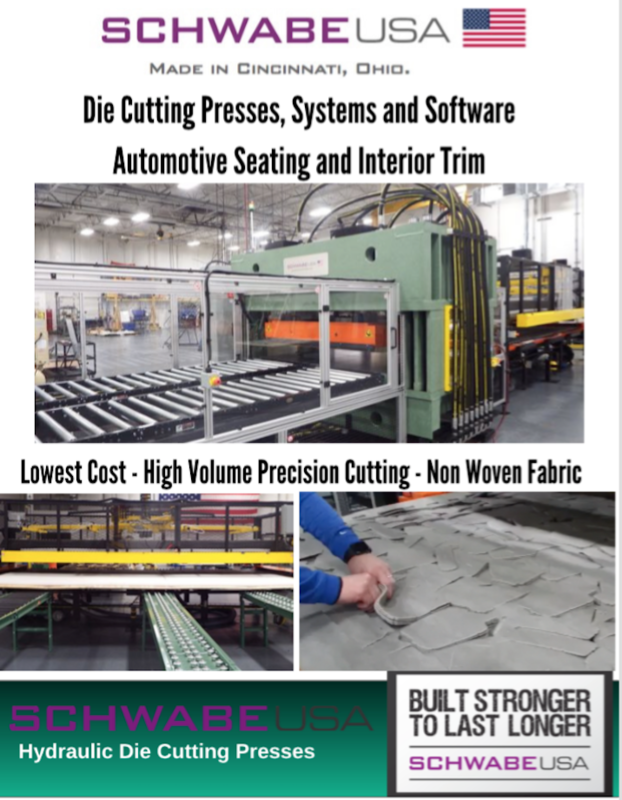 ODI's exclusive Dievac system uses vacuum to precompress laminated materials prior to cutting on SCHWABE Straight Ram Hydraulic Beam Press therefore eliminating material movement and insuring accurately cut parts.